The Witch is Path of Exile pure is often a measure of a character's information and mental acuity. Intelligence is necessary to use intelligence-based equipment and skills class, producing her an unmatched master with the elemental and dark arts. She wields the power of raw magic to decimate her foes from a distance. Her tremendous will surrounds her having a shimmering barrier against physical and magical attacks, a barrier that needs to initial be pierced ahead of the Witch herself is vulnerable. Along with pure damage-based magic, the Witch can also cripple and kill her enemies with curses and illnesses. She is a leery friend, along with a hazardous enemy. 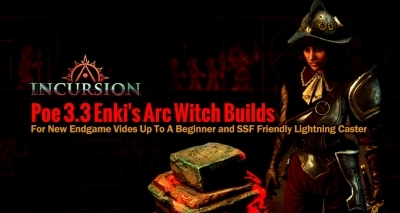 Right here you are able to locate the Summoner Poe 3.6 Builds for Witch. This Summoner build freezes, poisons, bleeds, blinds, maims, hinders, taunts, generates frenzy charges for allies, curses, lowers resists, gains LoH from attacks and spells, knocks back, and teleports, all as one action; and is assisted by two Frost Sentinels, a Solar Guard, an Agony Crawler, eleven Phantasms, eight Zombies, a Holy Relic, ten Skeletons, and forty Vaal Skeletons. 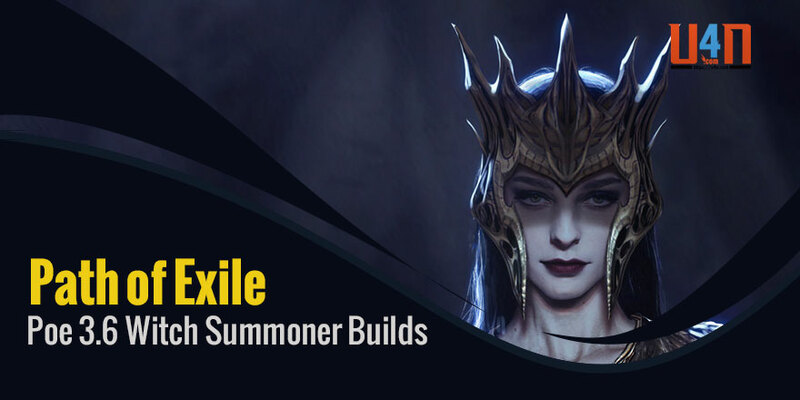 The goals of this build are to field as many minions with as many supports as possible, push summoner DPS to new heights while remaining tanky, be adaptable, and play fast, smoothly, and with minimal fuss. 1. Fast + You are able to be constantly on the move, even when you aren't, leaving a trail of death behind you. The only thing slowing you down is how quickly you may pick up items. 2. Versatile + All content (mapping, bosses, delving) and all map mods (enjoy unID maps). The different minions are each specialized so together they can overcome any problem. You deal with all harm types with all sources (melee, attack projectiles, spell projectiles), so no single monster defense cripples you (e.g. Proximity Shields). 3. Cheap Poe Currency + Only needs vendor gems to start. Grows with steady investment. Maximum cost depends on gear availability, but should not exceed more than a handful of Exalted orbs. I funded this build through the Chaos vendor recipe, several natural Exalted drops, as well as a few sales in the range of 1-3 Exalted orbs. 4. Powerful + Many builds cannot focus on more than one skill without interfering with their main ability. We bring to bear all our skills simultaneously. four.7 million is actually a real, constant DPS that is independent of temporary buffs like flasks or Vaal auras. 5. Safe + Moderately high ~7k health, fast recovery, strong avoidance, some mitigation, proliferated freezes, 32-72 minion decoys, and constant mobility. Very few things pose a problem. Just don't get cocky, you're not a tank. Watch out for one-shots like Enhanced Vaal Fallen leaps in Vaal Outposts or the scything attack of cloaked Cavestalkers in Abyssal Cities post-300 depth in delves. 1. Ramp-up Time + Full harm potential requires an initial set-up of several seconds, including four 0.43sec casts of Skeletons and several 0.35sec volleys of Ball Lightning. This makes it tricky too, for example, phase-skip and immediately kill the T15 Carcass boss (Amalgam) despite having the harm to do so. 2. Vulnerability to AOE + Skeletons, with 5771 life and 55% elemental resistance without jewels or Spirit Offering, are weak to hard-hitting area harm from some endgame bosses. Losing them can feel awkward since you should interrupt your Charged Dash routine to resummon. Your ramp-up is somewhat restarted by this since fresh Skeletons lack Frenzy Charges. Specters and the Agony Crawler can keep your harm output above a million while you reorganize your forces. 3. Maze-like Rooms + Even when you may shoot into a room, it doesn't mean your minions who have lagged behind will have the same line of sight. Doorways and corners restrict your minions' clearing potential, so be mindful of their position. Sometimes it's best to take advantage of their straggling by quickly diving into a room so they auto-teleport onto you when you get too far away. The Holy Relic, who keeps close, will be there to back you up if they don't. Even a few kills by your Spectres can spawn Phantasms in a room, who will then clear the rest of it. For truly harmful rooms, such as a shrine pack, summon Skeletons as far back into the room as possible to draw attention away from the entrance so you can burst in without taking a firing squad to the face. 4. Socket Starved + Like most summoner builds, we don't have the luxury of free socket space. The gear each gem will have to go in is also inflexible. Without overly changing the build, you are able to at best only drop Cast When Damage Taken, Spirit Offering, Greater Multiple Projectiles on Ball Lightning, and Fortify on Shield Charge for something else. This build is probably for you. The only issue with it is that it lacks single-target harm. Have you ever played an Arakaali's Fang build? 20 little spiders, not only attacking but poisoning the target with viper strike! Well, luckily for us, poison is actually chaos harm over time and Arakawa's Fang's aoe damage is not so good; some people even use Meele Splash Support gem in the dagger. But the weapon has pretty good single target damage. - Malevolence is the god. It's a crazy dmg boost! Also, skill effect duration increases the spider's duration. 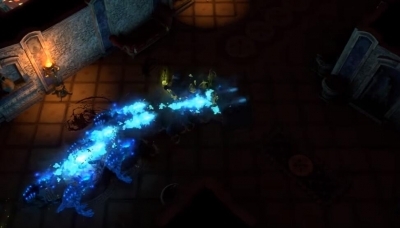 - Death's Oath's Death's Aura skill now deals 25% more harm per second. - Reworked curse effectiveness for bosses. This is huge for our build. - Storm Barrier Support/Infused Channelling Support! I feel like this is our new Spreading Rot and damn it's awesome! We save a lot of skill points on the tree, which is huge. - Added "Arcane Will" on the tree. Cool! + This build has A LOT of different variations, some of which are extremely expensive. So-min/maxing viability is huge! - Not a league starter. Arakaali's Fang may cost a few exalts. - Update: In 3.6 ES builds are meta. Because of this, many items from our wishlist got much more expensive. - Chaos Inoculation means this build is fully ES primarily based. Not for everyone. - Not the usual caster build. Some people don't like it. - Despite me talking about SSF in the end, this build is not SSF viable! - This is an engineering build. Major: Anything except the Brine King. I personally like Lunaris, and you are able to switch to Solaris for bossing. Minor: Any. I like Soul of Abernathy, otherwise, ignite delays you from ES recharge start. This guide was originally written as a paper concept during Delve League but now that tested it and modified it I can't stress how fun and versatile it is. In this thread all variants are welcome and we'll do our best to adjust and adapt to the challenges of each new league. The basis of this build is that we are a 9 golem elementalist focusing on Ice Golems great melee scaling as our core dps skill. The previous problems Ice Golems have always had was low time on target, this is completely solved by the +100% Move speed on the primordial chain. Our wide variety of golems give us immunity to Freeze, Shock, and allow us to really utilize the liege in the primordial ascendancy passive for that aura bonus per golem producing us regen nearly as much as an RF character. I'm currently sitting at +1200 Life Regen in my 3.4 gear. The Regen and relatively high effective health pool, combined with passive summoner playstyle let us safely dps while our little murder hobos do the bulk on the work. Optimal DPS is really a 6/1/1/1 setup with either Lightning Or Flame Golem as the odd man out. I prefer no flame golem as Shock Immunity > Ignite Immunity for my playstyle. Keeping that in mind though throughout the guide, if you want to ignite immune instead just swap the two gems they are completely interchangeable. usually swap Pantheons depending on the content doing, favoring Lunaris with Slayer upgrade for most content. Without lunar, you will take a lot of harm from projectiles chaining off your minions onto you while mapping. Arakali also can be fun for even more regen. For Minors usually, Shakari because I enjoy being poison immune.